Today while waiting for new students to arrive at the ECE dept open house, a bunch of us who were presenting were waiting out in the 5th floor hallway looking at each others booths and talking about what we were working on. 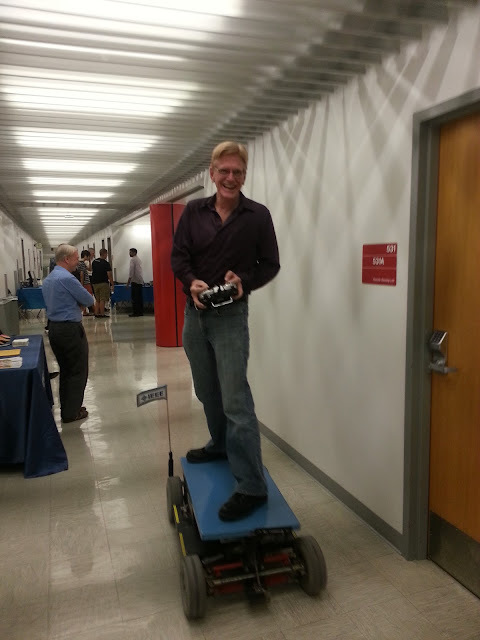 As usual, I had my large "Macromouse" robot up driving around the halls, and people were taking turns driving it around. When it was Dr.Marcellin's turn to drive, he tried something a little different. It is my pleasure to present to everyone Dr.Marcellin, surfing the robot. I would really love to get a poster of this in the main floor lobby.